In the last three days it has really started to feel like winter here in California. We've finally gotten some rain and the sky has that ominous winter glow. Perfect weather for soup and Pintrest! 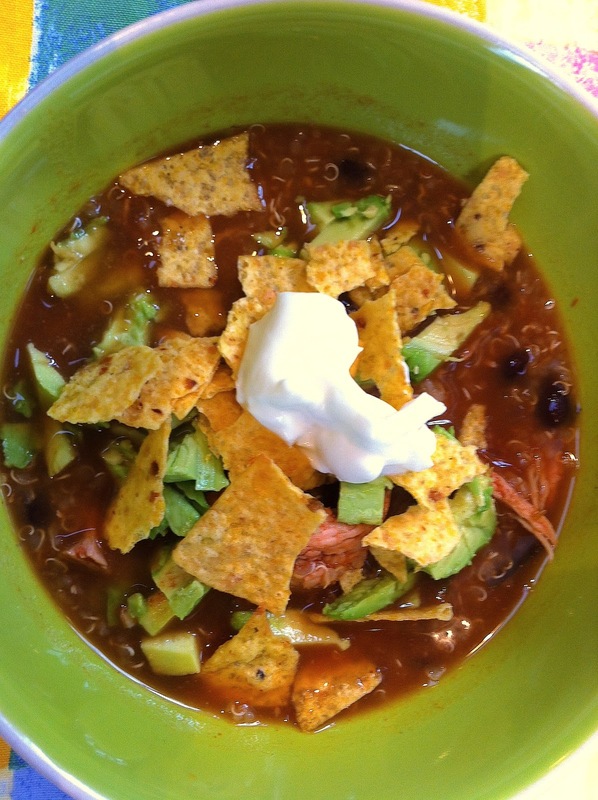 Today I decided that I really felt like Chicken Tortilla Soup. I didn't have a recipe handy and I was already at the grocery store so I grabbed a few things and away I went. 1. Bring 1 1/2 boxes of chicken broth to a boil in a large saucepan. 2. Add 1 can of black beans and allow to simmer. 3. In a separate small saucepan cook about 1/2 cup of Quinoa in chicken broth. When cooked add into the chicken broth and black beans. 4. In a large saucepan combine 4 boneless skinless chicken breasts and one large can of medium salsa. Bring to a boil and allow to cook at a slow boil for about 10-15 minutes or until the chicken is cooked thoroughly. *While I didn't have any on hand, in the future I think some fresh cilantro would add nice flavoring as well. OMG that looks amazing! i love torilla soup! i will trying this! !